One of the most important factors involved with choosing a college major is the potential for employment in a satisfying career when you finish school. If you're interested in learning about crime and punishment, you might wonder what you can do with a degree in criminal justice. More than 3 million people in the U.S. have already made the choice to enter this field. First, it's important to understand that criminology and criminal justice degree programs are not the same thing. The two fields are related and they do overlap in some important ways, but they're separate concepts. Your career goals should determine which you choose as your field of study. Criminology is the study of crime and its causes, costs, and consequences. Criminal justice is the system in which crime is detected and dealt with. In other words, criminology is the theory and criminal justice is the practical application. A number of job options and career paths exist for those who seek a degree in criminal justice. Most are found in the public sector, either in law enforcement, the court system, or the corrections system. A criminal justice degree is a great way to lay the foundation for a successful career in law enforcement. This degree can prepare graduates for work as police officers, detectives, investigators, or police dispatchers. 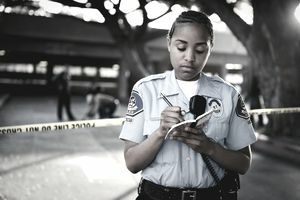 Not all law enforcement careers require a college degree, but it can still be very beneficial to earn one before you begin a career. Some employers additionally require knowledge or experience in the natural sciences, such as biology and physics, at least in some positions. A minor in science and a major in criminal justice or vice versa might be the ticket in these cases. Criminal justice majors who are interested in other law enforcement work can look forward to careers in crime scene investigation and forensic science. This can include jobs as a forensic science technician, a bloodstain pattern analyst, or a forensic ballistics expert. According to the Bureau of Labor Statistics, the median pay for police officers and detectives was $61,600 in 2016, the last year for which comprehensive statistics are available. "Median" means that half of those working in this field earned more than $61,600 and half earned less. More than 53,000 law enforcement jobs are expected to be added by 2026. The roles of prosecutor, defense attorney, or jury consultant all require advanced schooling, either a graduate degree or a law school and can require further certification like passing the bar. But other careers such as bailiff or paralegal require only some additional training and certification or a two-year associate's degree. Pay varies considerably in the court system depending on the job and the education required. The median pay for a lawyer was $118,160 in 2016, while paralegals earned median compensation of $49,500, according to the BLS. The corrections system carries out the punishments that have been determined by the courts. Penalties and sentences can include fines, restitution, incarceration, probation, or parole. Some corrections careers available to criminal justice majors include positions as correctional officers, probation and community control officers, or forensic psychologists. Some jobs in corrections don't require any college at all while others, such as those in forensic psychology, require graduate-level schooling. In either case, earning a criminal justice degree can help those interested in working in corrections if they want to move up in their careers. This is another area where pay can vary widely. Jobs that require a graduate degree tend to pay at least twice what others do. The median pay for a psychologist was $75,230 in 2016, according to the BLS. The job outlook for most jobs in criminology and criminal justice has historically been promising even in tough economic times. Communities recognize the need for well-trained law enforcement and corrections professionals, so many cities, counties, and municipalities make it a point to keep officers on the streets and guarding the prisons even when they're facing budgeting constraints. Law enforcement is always a priority. The courts also receive a great deal of support from their communities, counties, and states, ensuring that jobs are available more often than not. Careers in criminal justice offer a measure of stability not found in all sectors. They typically offer competitive salaries and generous retirement benefits. These, of course, are just a few of the many benefits of earning a degree in criminal justice. And, of course, if working in the public sector is not for you, numerous private sector careers are available as well for those with degrees in criminal justice, from security and private investigation to teaching. Beyond the job security and the potential for a comfortable life after retirement, careers in criminal justice provide the intangible satisfaction of knowing that you're working to make a difference in the world. If these career options don't get you excited, learn more about other great jobs in criminology and criminal justice.